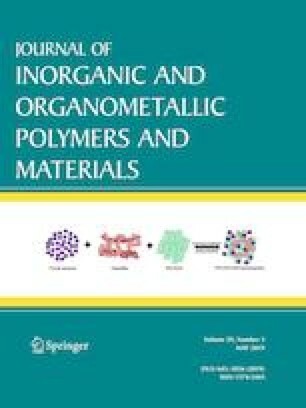 In this paper, zinc ion-exchange into the interlayer space of magadiite at different theoretical rates Zn2+/Si14O29 was investigated. Five Zn-exchanged materials, HyZnxNa2−xSi14O29 nH2O (x = 0.06, 0.21, 0.35, 0.57 and 0.82), were prepared and characterized using several techniques. As results, X-ray diffraction reveals that the basal spacing (d001) of the derivatives decreases with the increase of the zinc exchange rate, confirming the intercalation of zinc ions into the layer spaces of magadiite. This result is supported by thermogravimetric analysis, where an increase in decomposition temperatures is observed for Zn-exchanged materials. The introduction of Zn2+ ions into the interlayer space does not substantially affect the structure of the magadiite, but rather tends to stabilize it by increasing the decomposition temperature of the silanol groups. The UV-Visible DR analysis shows the presence of more than one intercalated zinc species in the all Zn-exchanged magadiite materials. The antibacterial activity for all exchanged materials was evaluated by the disc inhibition method against E. Coli and S. Aureus. The results show that the activity is strongly dependent on the zinc content of the Zn-exchanged material.